The mother of the bride is a very important and one of the most popular persons at the wedding right after the bride and the groom. So, it is necessary that the mothers appear extremely beautiful at the most precious event. Here is a fine list of hairstyles curated especially for you, the mothers of the brides. Appear uber-cool and classy at the same time with a blonde bob. You can choose to have a center-parted or side-swept bob filled with blonde hues to accentuate your appeal. Make sure to go for minimal jewelry in order to highlight your hair. Elizabeth Banks pulled her hair back into a glamorous bobby-pinned updo for the premiere of ‘Pitch perfect 2.’ This gorgeous updo is perfect for any formal or party occasion. So get yourself this hairdo and glam your look. You can look like a star throughout the wedding with a bouffant updo. First, you need to make sure that your hair is backcombed very well so that all the layers are straight and then you must pull up your hair to create a voluminous bouffant at the central or back part of your head and pin it tightly as an updo. Jaclyn Smith is looking great in this with a flattering, wavy hairstyle. The golden reflections looks fabulous onto Jaclyn’s cheekbones! Look impressive with bouncy curls. Make sure that you provide chunky curls to the layers of your hair and leave them free without using any pins. This will add volume and bounce to your hair. Heidi Klum wore an oversize braid wrapped into a sleek bun at the 2006 CFDA Fashion Awards. She look like Athenian beauty in this bold updo. If you want to look as dazzling as her try this updo and flaunt your locks in coolest way. Embrace class with the evergreen look offered by a classic ponytail. Smoothen up your hair first with a nice styling product and tie it up into a ponytail by making sure that all your hair looks perfectly in place. This high and bouncy hairstyle is perfect to wear on any formal or casual occasion. Get ready to obtain a stylish appearance with a curly bob. Make sure to provide curls all over the head because that would add lots of volume and bounce. You need not do anything else to your hair because the curls are enough to do the job. If you want to give your bob a bubbly bouncy look, try wearing it down and curling all over. Demi Moore looks excellent and elegant in this classic hairstyle. Appear like the next best lady in the wedding after the bride with an extra-long hairstyle. You can flaunt your long hair by providing loose waves from the mid-length to the ends of your hair. You may pair the style with long stone-studded earrings. Appear graceful with a French twisted updo. Make sure to wear a properly secured updo by giving your hair a French twist at the back. Use a good smoothing product to get a glossy appearance for your hair. This one is a comfortable yet trendy hairstyle for all the women with medium length hair out there. Heidi Klum always looks impressive with her different updos. Glow and shine at the wedding celebrations with a glossy updo. Blow-wave your tresses and keep them straight and sleek. Make sure to pull them back and tie them into a stunning updo. Don’t forget to use a nice hair product to provide the gloss. Appear extravagant with a half up medium hair. Take some layers of hair from both the sides at the front of your head and pin then towards the back for the half up. Then, make sure to provide curly texture to the remaining hair. This high bun updo is an ultimate elegance. It looks honestly pretty bold in that it puts all attention to your face, instead of creating distraction like a few down dos. For total perfection, wear this hairstyle with a classy makeup and outfit. Get the magical blend of volume and bounce for your hair with a loose curly updo. Go for soft loose curls from mid-length to the ends and then gently pull up the hair and tuck it to finish the fantastic style. 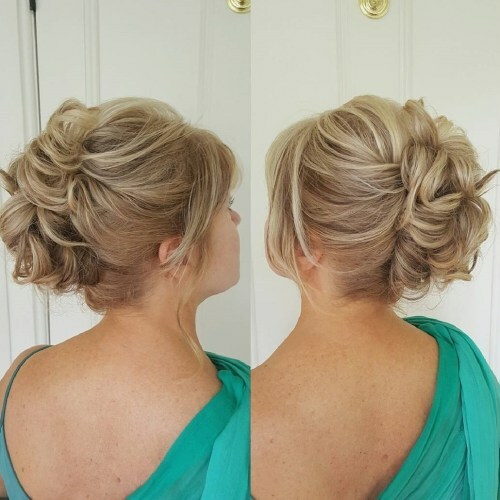 If you need to attend an outdoor wedding, then a messy curled updo will be the best style for you. You have to curl up your hair and combine it in a messy way at the back to form an updo. Make sure to leave a few tendrils loose at the sides of the face. Get set to strike a balance between the trend and the tradition by going for a messy pinned updo at the wedding. All you need to do is pin back the layers of your hair loosely and allow them to come together in a haphazard fashion but make sure to tightly secure everything. Be ultra-chic with a messy updo for the wedding. You simply need to draw up the entirety of your hair and combine it into an updo by leaving a few layers out here and there. Make sure to provide lots of waves to the layers of your hair. Even you can look youthful and trendy by sporting ombre waves. Color up your hair with ombre highlights and provide a center parting for face-framing. Look like a vintage diva with retro waves for your hair. Provide lots of bigger curls towards the ends of your hair and wear them by pinning them to one side. You may even go for finger waves on the top of your head. Look sassy even with short hair by choosing the short curled hair. Make sure to provide lots of curls within all the layers of your hair from the top till the ends. You may provide color highlights to place the focus on the curls. Appear vibrantly special by going for short curly wavy hair. You have to keep your hair till shoulder length and then provide it with lots of curls in a wavy texture right from the top of the head till the ends. Appear very elegant with a side chignon. You need to place your entire hair behind one ear and wrap it into a chignon. Make sure to accessorize your hair by using a floral hair pin. Bring out your bubbly side by sporting an updo with a bouffant. You need to first pin up a big bouffant at the front top of your head and then, roll the remaining hair at the back into an updo. You may choose to decorate the updo with a brooch. Get set to appear young and sprightly by sporting an updo with bangs. Make sure that the bangs appear natural and subtle over your forehead and then, tie up your remaining hair at the back into an updo. You need to keep the hair in your updo straight and soft. Some women assume that popular messy hairstyles are just for younger ladies. it is a simple misunderstanding, expensive ladies. no matter how old you are, you look more and more appealing, sparkling and stylish, with a modern day updo. This is a classic look that you can pull off with a bob cut. You can Wear curls and glam this old Hollywood glamour in grand style. So pair this beautiful style with stunning evening gown. Feel fancy and look fantastic with a voluminous swept-back half up. Simply provide a wavy texture to your entire hair and swipe it towards the back in totality. Then take a few layers and tie them into a half-up fashion to finish the style. If you want to get styled for a beach wedding, then a wavy bob will offer the best look for you. You simply need to pump up the volume in your bob, by creating wavy textures on the layers of your hair. You can complement this haircut with long and dazzling earrings. Pick from the most popular mother of the bride hairstyles in order to appear super stylish and graceful at the weddings.